If you are looking for a roof that will give your home the exquisite, modern look coupled with superb durability and longevity, a standing seam metal roof is the perfect system to meet your needs. Standing seam is considered to be the high-end option among all metal roofing systems. It’s quite popular among savvy, discerning homeowners who want to invest in a durable and long-lasting, energy-efficient and environmentally-friendly, premium quality roofing system that offers a true peace of mind for many decades to come. Standing seam is a metal roofing system featuring vertical metal panels running from the ridge of the roof all the way down to the eaves. 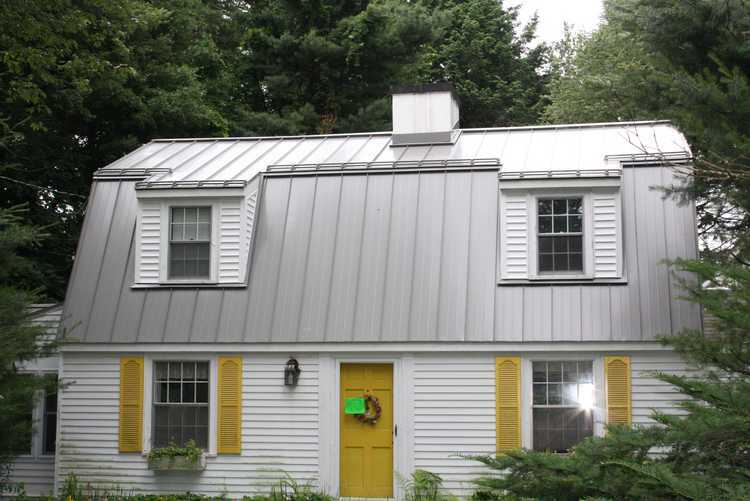 The upturned edge of a metal panel connecting it to the adjacent panel creates a distinctive vertical line known as a standing seam, which gives this system its characteristic, trendy, modern look. One distinctive design feature of standing seam is that there are no exposed screws or fasteners, which could become potential sources of leaks. Standing seam design incorporates hidden or concealed fasteners, which is what makes it more watertight than a similarly-looking ribbed or corrugated metal roofing system. Standing seam panels can either be pre-formed at a manufacturing facility or a sheet metal shop, or site-formed. Site-formed panels are formed from a roll of metal coil, which is fed through special roll-forming machine which crimps the metal into rigid panels. Forming standing seam panels right on the job site offers the advantage of speed, convenience, and makes it possible to form panels of considerable length that would otherwise be difficult to transport. In regards to panel length, it is important to be aware that longer standing seam metal panels require consideration during the design process to account for greater contraction and expansion of metal. Did you know? Both, longer and wider standing seam metal panels may benefit from being made out of thicker metal such 24 or 22 gauge steel, or thicker aluminum coil. A mid-panel rib-stiffening applied during fabrication process could help add more structural integrity and help prevent oil canning of the panels. There are a number of different types of standing seam systems. The most common type in residential construction is a field-locked standing seam. This type of system requires a special seam locking tool to adjoin the metal panels together. Another common type is a snap-lock standing seam, which locks the panels together when one side is adjoined or snapped-together with the one next to it. Lastly, there are standing seam shingle-based panels. 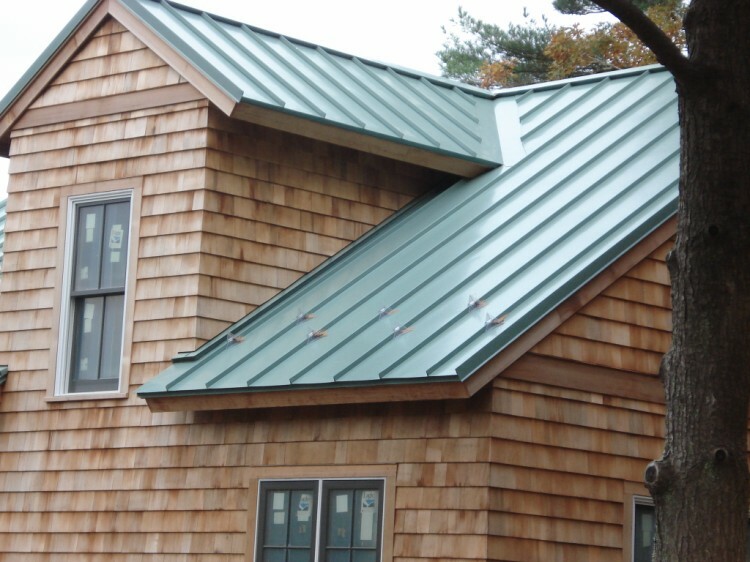 These have the look of standing seam, but they are actually vertical metal shingle panels. It is important to realize that a number of factors will determine a final price of a standing seam roof. First, the cost of materials may vary quite a bit based on the type of material you choose and from supplier to supplier. This means that you should do your research and get quotes from several different contractors or suppliers to ensure that you are getting the best deal. On average, expect your custom-fabricated standing seam materials to cost between $3.50 to $5.50 per sq. ft., depending on the system, type of metal, supplier relationship, and your location. Since most standing seam panels are custom made for a specific job, the price per square foot will depend on the total square footage of standing seam metal panels needed for your project. The larger your overall roof area, the less the materials will cost on a per sq. ft. basis. Your total average cost to install standing seam will vary greatly depending on your location; for instance, standing seam installation in NYC will cost considerably more than in a small town in Oklahoma. On average, a standing seam metal roof will cost between $8.00 to $14.00 per square foot installed, depending on the type of metal and its thickness, complexity of your roof, and location. Thus, you can expect to pay anywhere from $800 to $1,400 per square (100 sq. ft.) of standing seam metal panels installed, which should include materials, labor, and warranty. Regardless of the “average costs” in your area, you should still call at least three local roofers specializing in the installation of standing seam roofs to learn more about their products, experience, prices, and warranty details. Interviewing contractors in-person and getting on-site estimates, as well as reviewing their previous jobs will help you get a good sense for the quality of their work and pricing details. After speaking face-to-face with a few qualified installers, you will be in a much better position to select the best company. Please note that the cost of labor for a standing seam roof will be relatively high due to a requirement that standing seam should only be installed by specially trained installers who possess the right skills, a technical know-how, and the right tools to do the job. Great Curb Appeal: for people who want a modern look for their home, a standing seam roof is an ideal choice. Sleek lines of the roof, give the house a very cool contemporary feel and multiple combinations of panel widths, seam profiles, and rib heights offer design flexibility. The many sizes and styles of standing seam allow for an array of beautiful visual effects. Durability and Longevity: Standing seam roofs are known for their exceptional durability and longevity. This roof will not crack, shrink, erode, or perforate. It offers superior protection against fire and strong wind. Standing seam is one of the most stable and durable roofs for hurricane grade winds and hail. Most manufacturers offer systems rated for up to 110mph wind uplift or higher. You can have a real peace of mind with a standing seam metal roof, as it will last well over 50 years, requiring virtually no maintenance, but if and only if it was installed properly. Impervious to Moisture: seams are a the weakest point in any roof, often becoming the potential entry point for leaks. In standing seam, the seams are raised above the level of the roofing panel, making it impervious to moisture. Also, standing seam roofs have fewer seams in total than most other types of roofs. Sheds Snow and Ice: A standing seam roof is specifically designed to easily shed snow and ice. This keeps the roof light, improves ventilation and prevents ice-dams from forming. — This is what makes a standing seam roof perfect in regions with prolonged winters and heavy snow snow storms. Sustainable: An ever-increasing numbers of homeowners today are looking for a green roofing solution. Standing seam one of the few truly environmentally friendly roofing systems on the market. Since it is made of metal, the roof is completely recyclable, and standing seam also contains a significant proportion of recycled metal content. Moreover, a standing seam’s CoolRoof finish reflective properties will help you reduce energy waste and realize significant saving on your electric bill throughout the year. Have you ever considered investing in a PV solar system for your home? You can easily integrate a PV solar power system with a standing seam metal roof. Thanks to a special bracketing system designed to attach to the standing seams, there will be no need to make any penetrations i.e. drill any holes in your metal roof. 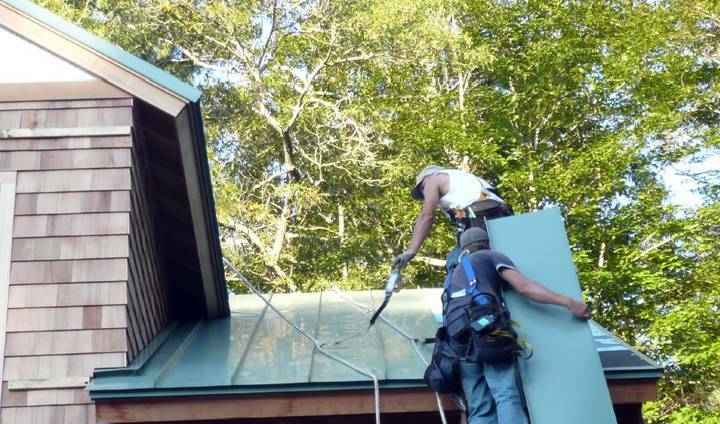 Standing seam requires both specialized knowledge, and tools for a proper installation. This means that only select few contractors will actually be able to install a standing seam correctly. Thus, you will have to seek a company that specializes in the installation of standing seam roofs. Looks: For homeowners who are looking for a more traditional look for their home, the architecturally-simple and modern (some may even consider it as too “commercial” or “industrial”) look of standing seam may not be the best fit, especially for homes located in some historic neighborhoods/districts. — For those homes, a metal shingles roof, an interlocking metal roofing system designed to replicate the look of more traditional roofs such as shingles and wood, may be a more appropriate choice. Minimum Slope Requirements: it is not advisable to install standing seam on a roof with a pitch of 2:12 or less (two feet of vertical rise for every twelve feet of horizontal span/run), unless otherwise specified by the system’s manufacturer. 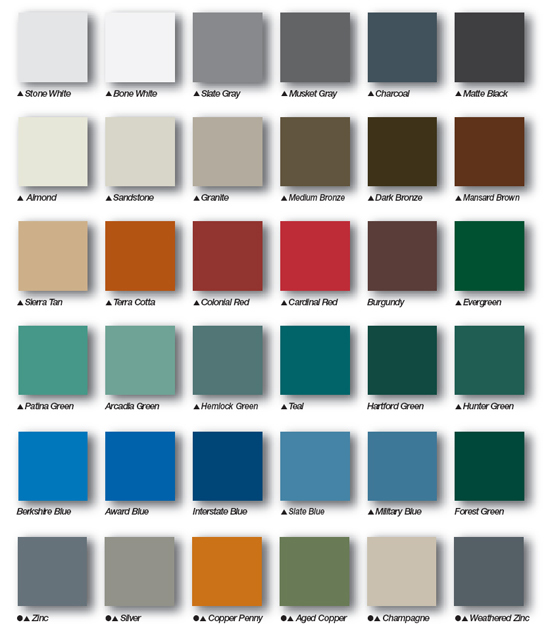 Speaking of more traditional-looking roof choices, some metal shingle profiles like the ones from Tamko Metal Works may only be available in a few, very specific color palettes such as earth colors, shades of green, brown, grey and red, which may not be up to some people’s liking. One important consideration point with standing seam, is a much broader selection of available standard colors, shades, coatings, and custom colors. Standing seam is the only way to go. Strength, durability, superior water-shedding, and more. Someday I’ll be able to afford a metal roof on top of my house. Wow, I had no idea that a standing seam metal roof could last over 50 years; that’s a really long time! Even if the cost is higher, it seems like it would be a worthwhile investment if you don’t have to replace shingles or worry about leaks. Plus, it is nice that there are so many types of sheet metal to choose from. When you have all of those options, you don’t have to feel like you are giving up style for durability!